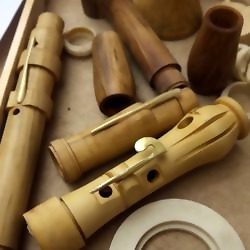 The Cambridge Woodwind Makers workshop was created to provide a space for experts in the crafts of musical instrument making to hand on their skills to others. We have an impressive list of tutors who teach around 35 students a year. The skills taught include tool making, design, measuring, wood turning, key making, instrument tuning and playing techniques. Clarinet, Oboe, Cornetto, Trumpet, Flute, Recorder, double reeds.